"The present humble work is a Pastoral effort, flowing from love to the Lord's people, and a desire to honour His great name. It is an acknowledged fact, that many of the Lord's people are living far below their privileges; and are walking as men, not aiming simply at the Lord's glory. This is to be regretted; and while none but the Lord the Holy Spirit can produce the change we desire to witness, yet the means are to be used, and we must stir up their pure minds by way of Remembrance. In this little work, I aim to speak in the closet, in the cottage, in the kitchen, and even in the field, to the different classes of the Lord's family; endeavouring to draw them nearer to their God and gracious Father. My desire is to promote the power of godliness; and these little pieces are written to convince, comfort, and correct; to fan the flame of devotion, and to produce holiness of heart and life. To this end some degrees of sameness in the pieces, and a repetition of some important truths, appeared absolutely necessary. Habitual dependence upon God for all we need, acknowledging the hand of God for all we receive, and walking with God, notwithstanding all that may happen to us below, enter into the very vitals of genuine Christianity; and it is only while we are thus acting that we enjoy peace with God, and walk in the comforts of the Holy Ghost. That the Lord, who often uses weak things to confound the mighty, may bless this little work to thy good and His glory." 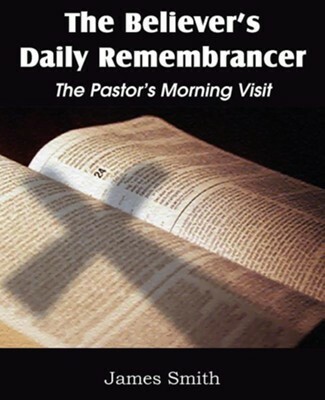 I'm the author/artist and I want to review The Believer's Daily Remembrancer: The Pastor's Morning Visit.